Outrageous signs! You’ve seen them near recreational, boating, and fishing areas. They are big, yellow, and rectangular. The goal is to communicate caution by using the international language, simple pictures. Now days they are just getting outrageous for some of the messages they’re trying to convey. Not to be out done, I came up with my own humorous signs that you may see at a recreational area near you. 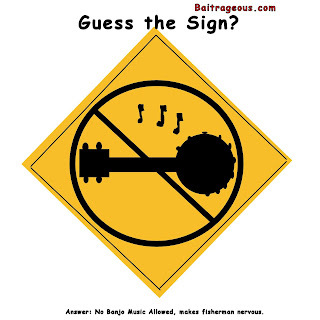 I call them “Guess the Sign.” I will be adding new ones every day or two this week. Here is today’s sign. It’s a known fact, banjo music make fishermen very nervous. If you were unaware of that fact, then you may need to watch the movie……….Deliverance. 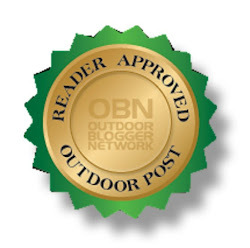 If you hear banjo music when fishing, kayaking, or boating……RUN FAST in the opposite direction. Hey, checkout my lake maps of your favorite lake at www.leolakes.com make a great gift. Now this brings up the hottest new product of 2013! Do you want to protect your favorite fishing hole from other fishermen that are trying to catch your trophy? Some clever fishermen are using banjo music, yep banjo music. They install a motion detector that is connected to a battery operated CD player. When a fisherman comes near their favorite fishing hole, banjo music starts to play. Boy, fishermen run so fast they often leave their fishing gear behind along with that trophy fish. Look for this new product in recreational stores near you. Life is short, get away from the big screen and get on a big stream, or at least put one on your wall! Check out my maps. I would assume that it would be the "dueling banjo's" song.